He's back! That's right, my back-on-the-bike commute is complete and it literally went without a hitch. Got a few notes on the route I talked about the other day with regard to the two-way bike lanes on Summit Street and also its mate on 4th, but suffice to say it felt great to get back on the bike on such a beautiful day. The Summit Street two-way bike lanes were pretty good, on the way south (with traffic). Again, though: Summit Street is a one-way street going south, with two lanes of car traffic. The bike lanes are two-way from Hudson Street south to 11th Avenue, where it turns into a one way bike lane continuing south - the northbound lane disappears at that point. Or, to look at it another way, it STARTS at that point. I will eat all the crow you people want to throw at me about bike lanes and such because this part of the ride was a joy. And here's one of the key reasons: this short movie will explain it all. What you're looking at: this is a car pulling in front of me to turn right. And the thing to note is the right-turn arrow in the car lane, combined with the stop signal in the bike lane. 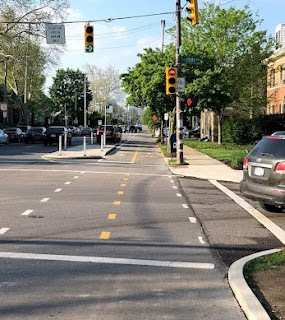 That's right - the bike signal and the regular traffic signal are synchronized to tell cars to stop when bikes are going straight and for bikes to stop so cars can turn right, over the bike lane. The situation reverses for bikes to travel through the intersection - the general traffic signal has a red right-turn arrow and the bike lane has a green signal. Here's a close-up of the signal situation (note that I took my picture at a full stop on my bike). Note the right turn green signal on the left, and the stop signal on the bike lane lights. traffic and the stop signal for bikes. This is exciting to me. 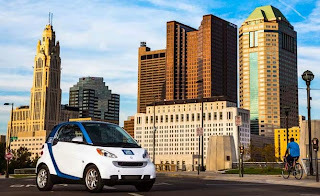 As Bike Attorney Steve Magas (a friend of Carless Columbus) tells us, the number one cause of car/bike crashes are turn-related. On a one-way street like Summit, the Left-Hook (where an oncoming car turns left in front of a through-riding cyclist and hits them) isn't an issue, so the number one danger on Summit Street would be the Right Hook - where a car trying to get around a cyclist to turn right in front of them misjudges the cyclist's speed and hits them). As long as both motorists and cyclists heed the traffic lights (and let's face it, traffic lights are more heeded by both cyclists and motorists than a simple stop or yield sign, much less the useless "Share the Road" signs) the Right-Hook completely goes away here. As I said above, the two-way separated bike lane ended at 11th Avenue, where it became a normal bike lane of the type that I've railed about - right next to car lanes, etc. At this point the lane had no signals as described above, just general traffic signals. Which, if you know how to ride conspicuously and safely, isn't an issue, but I can see how it might be troubling for people. I thought the transition from two-way to one-way was pretty seamless, though. 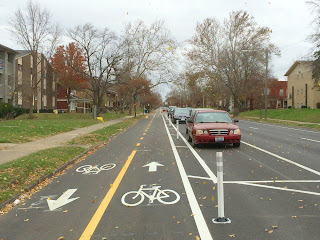 Also, unlike in other places, the bike lane had a three-foot painted buffer to indicate the door zone. The bike lane was pretty clean. Even with the amount of household trash out for pickup along the curb on Summit, the lane wasn't trashed up at all. There was a slight issue at 5th Avenue with some construction that had all the contractors' vehicles and equipment parked in the bike lane, but you could see it from pretty far back and make time to get into the general traffic lane without any problem. I didn't start my morning ride on the two-way lane on Hudson where the separation actually begins. I instead rode down a couple of side streets to Clinton Avenue and turned right there to avoid riding on Hudson during rush hour. Going over I-670 was less stressful than I thought it would be. The pavement was a little rough and caused some general vibration, but the signal for bikes to yield to traffic come off the expressway part-way across was clearly marked and quite safe, I thought. And my office is on Chestnut, the first right after the overpass. so that was easy. Major kudos go out to the building that my office is in. There is bike parking for employees on the first floor of the parking garage, accessible with my ID (I just had to talk to my HR manager in the office and fill out the paperwork - no fee, no nothing). A little more light over by the bikes would be nice, but the amenity is awesome and the nicest I've experienced as a cyclist thus far. If I wanted, I could get a very cheap membership to the gym in our office basement (I think it's $10/month) and have the ability to shower after my ride, but frankly I didn't need it today. Some Action Wipes will be more than adequate for that, and it was still cool enough this morning that I didn't even need that. So, here's the afternoon ride. The afternoon commute was a tad less stress-free. First, I had to figure out how to get out of our garage because the actuators for the garage door opening weren't working for bikes. Note: there's a button to open the garage that took me a few minutes to find. Getting onto 4th Street to go north was a tad dicey as well. 4th is a one-way street as well, going north and with the bike lane on the left side of the road. While it made it much easier to turn onto from Chestnut, it was uncomfortable to ride on knowing that motorists were probably less likely to be looking for cyclists on the left - being used to us being on the right pretty much everywhere else in the city/world. The lane was pretty well marked, with dotted lines near the intersections, etc. like there should be on such a lane. It was kept pretty clean, too. Really, the only problem was the location being on the left. Traffic crossing 4th Avenue didn't seem to be looking too hard for cyclists approaching - especially in intersections/junctions with no signals. So, just to see what it was like, I took a left onto 11th Avenue and made my way back over to the Summit St. two-way bike lane. Turning right onto a one way street going left was a weird feeling, but once I got into the lane if felt okay. Being separated from the rest of traffic by parked cars and the bus islands made it a more comfortable ride. And the bike-only traffic signals were in place for the northbound bikes as well. I was very conscious of trying to make sure I was visible to south-driving cars that might want to turn in front of me. That was also a weird feeling. I got off of Summit before getting up to Hudson for the same reason as the morning commute - to avoid Hudson traffic. The rest of the ride home was uneventful, even pleasant. All in all, while the two-way nature of the Summit St. bike lane worked, and even felt pretty good to ride in going south, it was too weird going against traffic going north. And even worse was the left-side bike lane going north on 4th Street. I constantly felt like I was trying too hard to call attention to the fact that I was there, despite my fluorescent yellow jacket and all (the same one I've worn all along). All in all, it felt darned good to get back on the bike. I have a couple new bits of gear I need to get - new panniers and especially one that can hold my laptop, plus new riding glasses (the rubber is flaking off my old ones). But all in all, it was nice to see that I hadn't lost any of the skill and confidence as a rider. It really is just like riding a bike.